There are 12 foods that, if eaten on a regular basis, do wonders for your health. Do you know what they are? If you're reading this than you already have some knowledge of how important good nutrition is. I'm a big advocate of "you are what you eat." Meaning, what you put in your body largely determines what you look like on the outside. And if you make a serious effort to improve your eating habits, you will notice a positive change in how you look and feel. It's not about perfection though. Thrive to make small changes to your diet over time and you'll eventually be amazed at the will power you develop. There are 12 foods that you should be eating on a regular basis. All have their own unique health benefits and if you mold your diet around the majority of these foods, you'll notice an improvement in your health. 2. Beans and legumes- a great source of fiber and protein. 3. 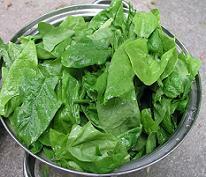 Spinach and other green vegetables- a great source of phytonutrients and antioxidants. 4. Low-fat dairy- a great source of calcium and protein. 5. Oatmeal- a great source of fiber and protein. 6. Eggs- a great source of vitamin E and protein. 8. Natural peanut butter- yes, this can be included under #1, but natural peanut butter makes eating nuts easier because you can spread it on wheat bread, bananas, celery, etc. 9. Olive oil- a great source of good fat. 10. Whole-grain breads and cereals- a great source of fiber. 11. Extra protein- a great source of protein! 12. Raspberries and other berries- a great source of antioxidants. All 12 foods above have a high nutritional value and should be incorporated into your daily snacks and meals. Ryan Cote is the owner of http://www.SimpleHealth123.com, a health and wellness website supplying aging healthy products and free resources, and http://www.GetHealthyReport.com, home of the anti-aging report Get Healthy!